Depending on the size of your organization, the number of records in your database can reach a substantial size. In certain situations, you may be interested in viewing subsets of your records so that you can focus on a particular group or type of information. By applying basic or advanced filter controls, you can narrow down your data and view just the information that you want to see. The Rolodex filters give you the ability to retrieve and display only those records that start with the selected alphabetic or numeric character. Select the column containing the information you want to view. A directional arrow or is displayed to the right of the column name to indicate that the column is selected and to indicate the direction of the sort (ascending or descending). The Filter Column field, which is located under the filters, identifies the name of the column you are sorting on and the direction of the sort. In the sample illustration above, this field displays Name Ascending. The content reloads and information with the filter criteria you specified is displayed. Using our example, the resulting list of staff members shows only those whose last name begins with the letter "M". The Filter Criteria field, which is located just under the filters, identifies the filter that you are using. In the illustration below, this field displays the letter "M". 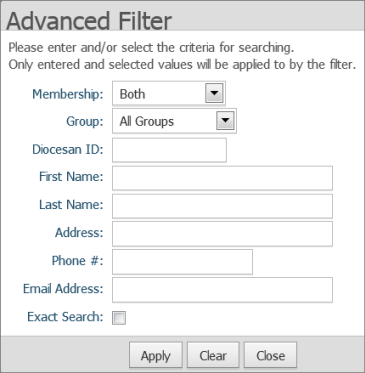 The Advanced Filter lets you search records using multiple search criteria. The filter applies all of the criteria you supply to search the database. On some pages, the Advanced Filter setup contains the Last Name field only as a search option. On other pages, the filter contains multiple search fields like the one shown in the illustration below. Select or type the criteria for your search in one or more of the search fields. Click Apply to conduct the search. The list updates and displays result of the search. To clear the Rolodex filter settings and re-display all of the records in the list, click (Clear Filter).